I had been trying to come up with a way to share this product in action with my readers. After a near fail, an opportunity finally presented itself. 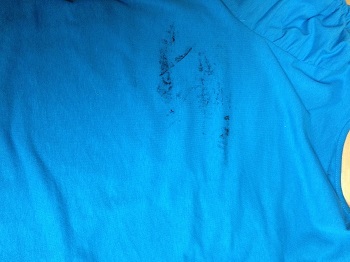 Normally laundry is already in the wash before I discover the stains. You couldn't help but to notice the giant stain on the back of my daughters blouse! My children returned to school today. My daughter was excited to wear her new blouse to school. We were standing in the kitchen getting ready to prepare dinner when she turned around. I gasped when I noticed the black, oily stain on her brand new blouse! She exclaimed that it must have happened on the bus, but couldn't give me a time frame. It could have happened this morning or afternoon. How in the world was I going to remove this greasy stain?! I instructed my daughter to change her shirt quickly. 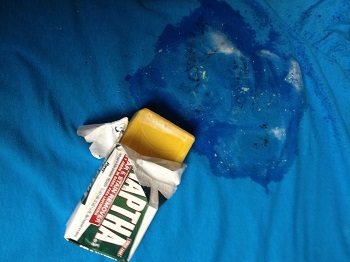 The Purex Fels-Naptha bar would hopefully remove this stain! The following picture is her blouse before treatment. The instructions were clear and easy to read. It says to wet the stain and rub the bar over the stain. However, it didn't say how thick or whether or not the stain would start to disappear when being treated. The instructions stated to wash as usual. For added stain removing power, grate some of the bar into your laundry. I washed the blouse in cold water. I've always been taught that hot water can set the stain for harder removal. I was very skeptical while treating her blouse. The stain appeared to be there for eternity. The bar was surprisingly easy to rub onto the blouse. 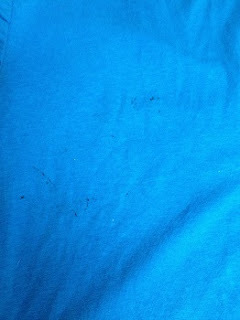 The following picture is the blouse during stain treatment. After tossing the blouse into the washing machine, I wanted to dry off my Fels-Naptha bar. A paper towel worked well with drying the bar. As you can see in the photo below, I placed the dry bar into a sandwich bag. After the washing machine stopped, I pulled out the blouse for inspection. The stain wasn't entirely removed which was disappointing. However, it was greatly reduced! I treated the stain and washed once more. You can see the results in the final picture below. I am pleased with the results. You can still see some of the stain, but not as deep as before. My daughter can continue wearing this to school. I hung her blouse on a hanger to dry and will treat it again. 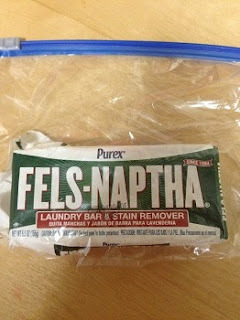 Millions of people have been using Fels-Naptha for over 100 years! I'd like to share a simple laundry detergent recipe with my readers. I have found this recipe on several websites around the net. Add grated soap to a sauce pan with 6 cups water. Heat and stir until the soap melts. Add washing soda and Borax powder, stir until dissolved. Remove from heat. Pour 4 cups of hot water into the bucket. Add soap mixture and stir. Now add 1 gallon plus 6 cups water, stir. Let the soap sit in the bucket for at least 24 hours until a light gel forms. Use 1/2 cup per load of laundry. To keep laundry fresh, close bucket with a lid. The Fels-Naptha bar has also been known in treating poison ivy. However, the Dial corp. has expressed disapproval in this method as the soap bar is skin irritant. If you try this home remedy at home, you could experience an irritation. Follow Purex on Facebook to learn about new promotions and products. Don't forget to enter the 120 years, 120 winners sweepstakes! Sweepstakes ends August 28, 2013. **Disclosure: I received a sample of this product from Purex along with some coupons. I randomly gifted the coupons to consumers wishing to try this product. All opinions in this post are my own and true. Product results may vary.